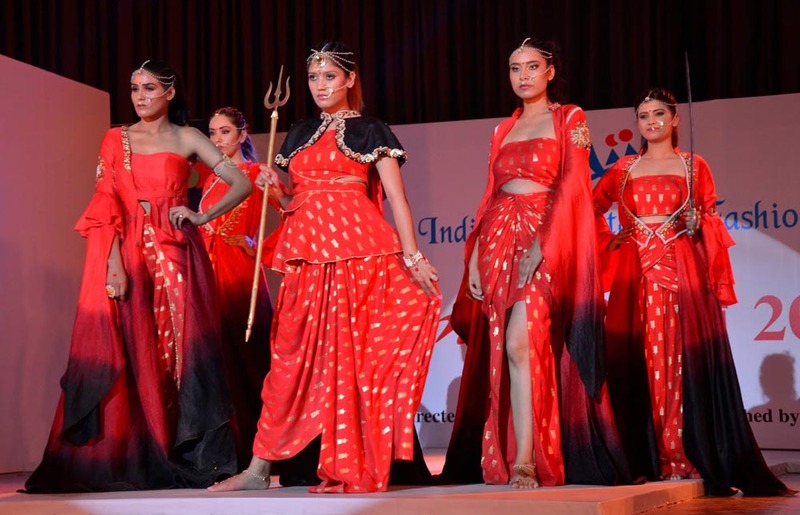 Mohali, May 22, 2018 (Team Online News India): The occasion was 'Anukama 2018', the annual design collection show of Northern India Institute of Fashion Technology (NIIFT) Mohali. The Chief Guest Sunder Sham Arora Industries and Commerce Minister, Punjab has graced the occasion with Special Guest Rakesh Kumar Verma, Principal Secretary, Industries and Commerce, Punjab and Chairman NIIFT and D P S Kharbanda, DG, NIIFT. Famous models of national repute took the stage by storm this evening to showcase the 52 hands-on beautiful collections created by the graduating fashion design students. NIIFT is ranked 9th amongst the top 10 fashion design colleges of the country and also has been declared as a centre of excellence for apparel and textile in the new industrial policy of the state government. The highlight of Anukama ,18 came when a collection named 'Zari Misl' inspired by Hon'ble Chief Minister of Punjab Capt Amarinder Singh's book on The Battle of Saragarhi -- 'The 36th Sikhs in the Tirah Campaign 1897-98' was presented by the designer Simranjit Kaur. Sneha has created a collection named 'In the Name of Love' a tale of acid attack survivors. In fact an acid attack victim Ritu Saini also walked the ramp in an attire from Sneha's collection. Rajeshwari created a collection to bring upfront the violence against women and child sexual assault, this she achieved by applying social messages on garments, a little girl Rabia also walked the ramp in the memory of Asifa. Guneet's 'Pastel Rush' inspired from filigree, an ornamental art work done with silver and golden wires was also presented. Dollsy showcased her collection 'Gulzar' created using the quilling technique and with motifs taken form Mughal monuments specially the Taj Mahal. 'Tree of Life' by Nitika Ghavri , 'Adishakti' by Maya, Alisha Gulati's 'Zeenat Begum' which was a Mughal Collection, Terracotta was the very new concept that used to enhance the surface. Sunder Sham Arora, also gave away the awards to the promising students. A total of 16 awards were given to the deserving students on the basis of their performance. The awards are as follows: The Best Design Collection award went to Priyang, Best Garment Construction was bagged by Anjali, Best Commercial Collection was shared by Alisha and Kanika Chugh. The Most Creative Collection went to Simranjit Kaur. Best Concept was earned by Rajeshewari and Sneha. Most Innovative Pattern making was shared by Jaswiner and Kirti. Best Surface Ornamentation was shared by Dollsy and Trisha. Best use of Craft in Design was shared by Komal Bhatia and Shailey. Best use of Art in Design was shared by Arpita and Priyanjali while the Best Design Vision (a jury special award) went to Mehakpreet. Certificates of merit were given to Nikita Ghawri, Sakshi, Sejal, Guneet, Lehar, Manya, Nancy, shruti, Parul and Khanak. Sunder Sham Arora, Industries and Commerce Minister, Punjab, said that NIIFT has done Punjab proud. The students who pass out from here act as brand ambassadors for Punjab when they make a mark in their chosen jobs or by creating start ups not just in Punjab, but other parts of the country. Rakesh Kumar Verma, Chairman, NIIFT said that the mission of NIIFT is to educate and mentor students interested in a career in fashion by imparting skill based training which is in tune with Industry requirements. This is where NIIFT plays a vital role in shaping the students' into talented designers. D P S Kharbanda, DG, NIIFT said that students used the platform of Anukama 18 to present their signature style. They put in their best of work which could be seen in the collections presented. These students were guided by their Mentors- Dr. Poonam Aggarwal, Dr. Simrita Singh, Deepti Sharma, Gobiend Rai and Navdeep Kaur. An eminent jury made up of Fashion, Apparel and Textile Experts evaluated the designer collections. Dr Simrita Singh, Coordinator, Anukama 2018 and HOD, Fashion design department said that we feel proud that 15 of our students walked the ramp alongside professional fashion week models. In fact NIIFT student Khushboo Rawat who is Miss India Khadi 2017 was the show stopper. 30 female and male models walked the ramp adding the glam quotient to the students' creations. Big B on Sabse Smart Kaun? Divyanka and Vivek not ready for parenting yet!